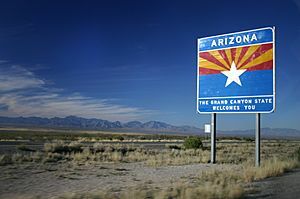 The State of Arizona website, museum, and official materials cite the following origins of the Arizona flag: "Charles Wilfred Harris, Colonel in the Arizona National Guard, served as the captain of the unit’s rifle team in 1910. During the rifle competition at Camp Perry, Ohio, the Arizona team was the only team without an emblem of any kind. Colonel Harris was chiefly responsible for the creation of the rifle team flag that in 1917 became the Arizona State Flag. Blue and gold are the colors of Arizona. Red and gold are the colors carried by Coronado’s Expedition of 1540 to the Seven Cities of Cibola. The blue is “liberty blue” identical to the color in the United States flag field of stars. Since Arizona is a western state, the rays of the setting sun seemed appropriate. There are thirteen rays representing the original “thirteen colonies.” The large copper star identifies Arizona as the largest producer of copper in the United States. "On February 27, 1917, the legislature passed the bill to adopt this flag as the official Arizona State Flag despite dissenting votes and Governor Campbell’s refusal to affix his signature to the bill." While Colonel Harris is credited with the creation of the Rifle Team flag, several individuals appear to have played a role in the creation of the state's first official flag. W. R. Stewart of Mesa was working in conjunction with Colonel Charles W. Harris, who was the Arizona Adjutant General and head of the Arizona National Guard. Stewart, as President of the Mesa Rifle Team, felt compelled to design a flag for competition. Stewart's wife (Mae) sewed the first flag for competition from a sketch he had made on the back of an envelope. Carl Hayden, Arizona's first US Congressman, was reported to have been involved with Colonel Harris in designing the first state flag, and his wife, Nan Hayden, was responsible for sewing the first state flag. Rachael Berry, a leader in women's suffrage and the first woman elected to the First Arizona Legislature during Arizona's first year of statehood in 1912, also is reported to have codesigned the Arizona flag with another woman (likely Nan Hayden) in the years preceding statehood. Many individuals likely were involved in its conception, design, and production, rather than one or two individuals working independently; the specific language used in official state of Arizona materials likely has merit. The Stewart/Harris version of the competition flag's origin is due to Stewart dropping some copper dye and white material into boiling water and the result was the copper color now seen on the flag. While some sources claim the rising sun of the earlier proposals was thought to resemble the Japanese flag and was therefore changed to the present star, most official sources (including official state documents) cite the Spanish flag and the influence of early Arizona explorers, such as the conquistadores Cabeza de Vaca and Coronado, as they searched unsuccessfully for the lost (gold) City of Cibola as the inspiration for the colors. However, these early explorers never used the current Spanish flag, which is of much more recent design (1785). In a 2001 poll conducted by the North American Vexillological Association, the Arizona flag was identified as one of the "10 best flags on the continent," ranking sixth of 72 North American flags for overall design quality. To properly produce the state flag, the height of the flag is two units high while the width is three units wide. The sun rays at the top are divided into 13 equal segments, starting with red and alternating with gold until the rays are complete. In the center of the flag, the copper star is one unit high, while the rest of the flag is covered by blue section measuring one unit high and three units wide. The colors of red and blue are the same shade used on the flag of the United States. The specific colors of copper and gold have not been set down in law. The suggested flag size is four by six feet, with the star being two feet tall. Flag of Arizona Facts for Kids. Kiddle Encyclopedia.